Before video killed the radio star and digital killed the video store, audio killed the silent film biz. Also, if you pass gas in a silent movie theater, it resonates a lot louder. I’m just sayin. I tried to watch all the Best Picture nominees before the Oscars and failed. Of the six I saw, I was not impressed. 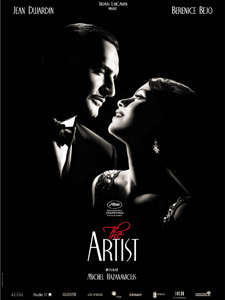 For months, I could not talk Jenn into going to see The Artist with me. She claims it’s because she’s pregnant and silent movies make her nauseous. But it’s really because she’s pretentious and addicted to color. Also, I don’t imagine she wanted to have to worry about farting uncontrollably for the reasons I already talked about. So I went by myself to see the valedictorian of summer school, so to speak, as the six nominees I saw previously had a subpar bug average of 4.9 (out of 10). That number was up to 5.6 by the time I left the theater. This movie was friggin adorable. It jumped out of the gate with pizzazz, both captivating the audience with humor and setting the groundwork for the characters. Including the dog, who would be the real hero of the film. Rarely do I ever root for a happy ending outside of Vegas, and I very much was. And they knew just how to pull it off without being campy. It deserved all 5 Oscars it won and probably one for cinematography, though I understand the Academy’s need to stroke Scorsese’s ego with some second-level throwaway awards. Thanks, Clecira. I’m in the process of building this site and just transferred all my posts over from the old blog but I appreciate the comment and I’m glad you enjoy it.